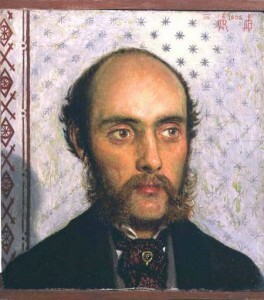 William Michael Rossetti was not only the brother of Dante Gabriel and an original member of the Pre-Raphaelite Brotherhood, he was also their chronicler. Read his contributions to the Pre-Raphaelite journal The Germ here. He was considered a “secretary of the PRB” and it is because of him that much is known about Elizabeth Siddal. It is equally because of him that much is misunderstood about Elizabeth Siddal. WMR took a revisionist view of his sister-in-law. He changes her age, making her younger. He is unclear about when his brother, Dante Gabriel Rossetti, and Siddal became engaged. Keeping these flaws in mind, it is important to take his words into account if we want to further explore the tale of Elizabeth Siddal. In order to study WMR’s account of Elizabeth Siddal and her relationship with her brother, I’ve chosen to begin with a document written by WMR and titled Dante Rossetti and Elizabeth Siddal which was published in 1903 and published by The Burlington Magazine for Connoiseurs, The Savile Publishing Company, Limited, 14, New Burlington Street, W. The full article can be read here at the Rossetti Archive. I do not share the entire text here, just portions that I feel are pertinent and my own impressions. I do, however, welcome your comments and input so feel free to converse with me through the comments section. Then he shares a bit of background of her last name and explains why he continues with the same spelling. I may begin by mentioning that the correct spelling of the surname appears to be Siddall: but Dante Rossetti constantly wrote Siddal, and I follow his practice. Elizabeth Eleanor Siddal was the daughter of a Sheffield cutler, and was born in or about 1834; as my brother was born in May 1828, she was some six years his junior. The family came to London—New-ington Butts or its neighbourhood; this, I take it, was before the birth of Elizabeth. I do not know when the father died; it must have been prior to the time when Elizabeth was known in any artistic circle. We know that WMR is wrong in saying that Lizzie was six years younger than DGR, this has already been proven with records and Lizzie’s birth year has been established as 1829.